Pollen & Bleu by Singland Development presents an innovative residential development located in the Prime Exclusive District 10 of Singapore. Stands at eight-storey high, this contemporary development has a total land area of close to 67,471 square feet. State-of-the-art condominium facilities is well equipped for the ease and comfort of every occupants at Pollen & Bleu. Savour the exclusivity and leisure as you gather with your friends and loved ones over a BBQ, go for a swim or just simply relax and look up to the sky while lounge around by the pool deck. In addition, spacious individual bedroom, master room, and living room are in order for the soothe of you and your loved ones. The development is neighboring to a number of MRT stations which include Farrer MRT, Botanic Gardens MRT, Napier MRT, Commonwealth MRT, Tah Kah Kee MRT. It is nearby to major expressways such as Ayer Rajah Expressway (AYE) and Pan Island Expressway (PIE). 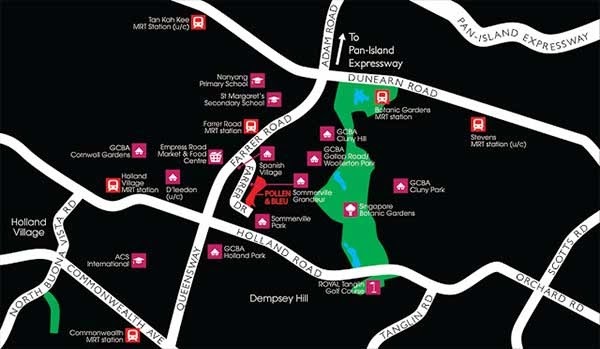 Pollen & Bleu is set just a short walk away from shopping centres include Tanglin Mall, Coronation Shopping Plaza, Holland Road Shopping Centre where a host of conveniences are right away available, such as supermarkets, restaurants and food courts, banks, and entertainment facilities. Numerous respected schools situated within the vicinity include Raffles Girls' Primary, New Town Primary, Nanyang Primary and Secondary School, St. Margaret Secondary, Queensway Secondary, Hwa Chong International, and Anglo Chinese School. See http://www.pollen-bleu.net/ for additional information or ring the marketing team at 6100 0877 for enquiries.